In late August, I was enjoying spectacular views of Lake Lanier — a sprawling water resort in Georgia about an hour outside of Atlanta. Most of these vistas came courtesy of Kubota’s newest entry in the utility vehicle market — its gas-powered RTV-XG850 Sidekick — a crossover work and recreational UTV that goes up to 40 mph. A week after my trip, CE editor Chris Crowell visited a popular UTV manufacturer’s R&D facility to test drive a secretive new entry into the segment. Overall, the UTV industry continues to heat up. Here are some big headlines of late. 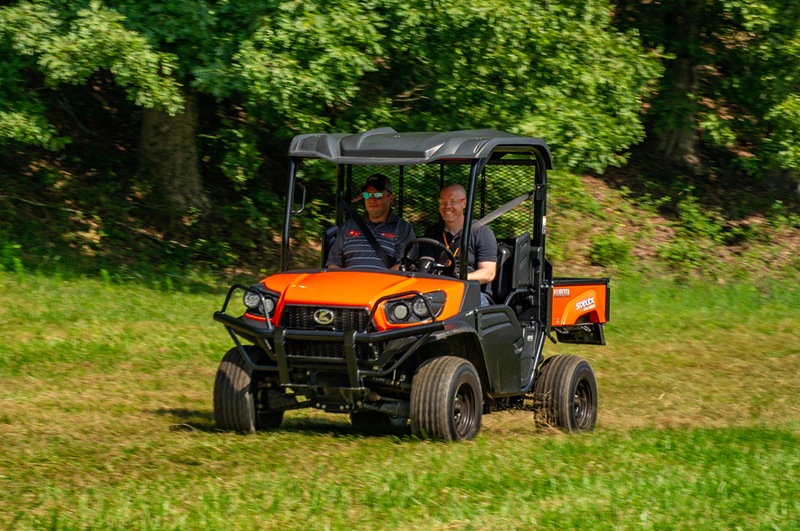 Kubota Speeds Up: The RTV-XG850 Sidekick has been highly anticipated by dealers as it is Kubota’s fastest utility vehicle yet, with a powerful 48-hp gasoline engine, delivering speeds of up to 40 mph, compared to the top speed of 29 mph for its RTV-X models. The Sidekick comes in four color schemes, also a first for Kubota. Cat Adds Room: Last year, Caterpillar announced the introduction of its first-ever Cat utility vehicles — the gas-powered Cat CUV82 and diesel-powered CUV102 D. To expand that offering, Cat now includes the gasoline-powered Cat CUV85 and diesel-powered CUV105 D, both featuring a spacious second row to accommodate up to five people. Club Car Embraces Leasing: The UTV pioneers at Club Car announced a cool lease program for its premium Carryall brands. The Club Car 3 & Out UTV Lease is designed to provide an affordable three-year lease option to indie rental businesses, construction companies and industrial sites who want access to top UTVs like Club Car’s Carryall 1500 and 1700s. Kioti Goes Crossover: Earlier this year, Kioti Tractor launched its new K9 utility vehicle series, focused on the crossover multipurpose market. The K9 boasts an enhanced level of performance, comfort and standard features, from a new automotive-style dash configuration to front/rear independent dual A-arm suspension to ground speeds up to 31 mph. Dealers Go to UTV University: One of the best places for dealers to understand the evolving utility vehicle market is at the GIE+EXPO trade show in Louisville, Ky., on Wed., Oct. 17. UTV University will feature powersports dealer training specialists, top UTV experts and the opportunity to walk the show floor during the exclusive Dealer Preview.